Can you learn NLP from a book? Absolutely not! Having said that, you’re probably going to want to find out at least a little bit about NLP before committing to the time and expense of a live training. So a decent book can be a good way of dipping your toe in the water and getting a sense of what NLP is about. 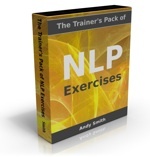 These are my pick of the NLP books for beginners. 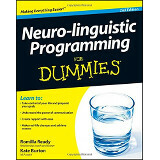 But remember, even the best book is no substitute at all for learning NLP in a live training with a competent trainer. Yes, it’s my own book – but it’s had enough five-star reviews to be confident that you’ll find it useful. It has practical exercises so you can start making your life better even before you attend a live training. Note: the book is only available in Kindle format (remember you don’t need to buy a Kindle to read it, as you can download a free Kindle app for your computer, smartphone or tablet from the Amazon site). 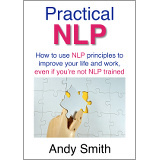 And you can get the audiobook version free when you sign up to the Practical NLP Tips newsletter – use the ‘Claim your audio course’ yellow button in the column to the right (or further down the page if you’re viewing this on your phone or tablet). 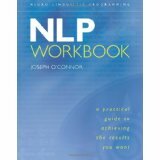 This book is an ideal place to start with NLP if you’re not normally a big reader. It’s in the usual ‘For Dummies’ format with lots of diagrams and pictures, and short, accessible chunks of text. Some reviewers have slammed it for a few minor technical errors, but of course book reviewers by definition don’t fall into that ‘not a big reader’ category. 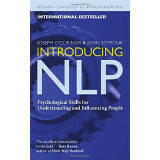 The best NLP book to start with is the one you will actually read! 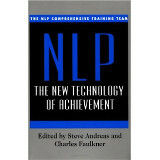 An excellent reference book for anyone starting an NLP Practitioner training. As the title suggests, it’s full of exercises for you to practice. Written back in 1979 when the co-founders of NLP were still working together, this is essentially a transcript of a seminar on sensory acuity, anchoring and reframing – a format that some people don’t like, though personally I find it very readable and compelling. Some of the techniques that are presented may now have been superseded by more elegant ones, but the attitude of NLP comes through loud and clear. If you can handle the seminar transcript format, it’s the best introductory book to NLP you can get. Loads of practical, easy techniques for self-help, personal development and achieving your goals. Some British readers might find the relentless “American” positivity and can-do attitude a bit grating. My advice: get over it! Our national cynicism is very useful in some contexts, but you have to use it discriminatingly or you can end up missing out on some really good stuff – which this book is full of. A very clear summary of the field of NLP, written by British authors. 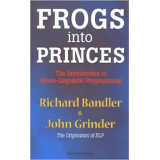 It’s almost a reference work, so of necessity it’s a bit drier than, for example, Frogs Into Princes – but a very fine introductory book all the same.